You'll be £16.99 closer to your next £10.00 credit when you purchase From the Dreadnought to Scapa Flow Volume I. What's this? The five volumes were subtitled The Royal Navy in the Fisher Era, 1904–1919 and they are still, despite recent major contributions from Robert Massie and Andrew Gordan, regarded by many as the definitive history of naval events leading up to and including the Great War. This first volume covers many facets of the history of the Royal Navy during the pre-war decade, including the economic and political background such as the 1906 Liberal Government hostility towards naval spending. Inevitably, however, attention moves to the German naval challenge, the arms race and the subsequent Anglo-German rivalry, and, finally, the British plans for the blockade of the German High Seas Fleet. A new introduction by Barry Gough, the distinguished Canadian maritime and naval historian, assesses the importance of Marder's work and anchors it firmly amongst the great naval narrative histories of this era. From the Dreadnought to Scapa Flow Volume One The Road to War1904-1914 examines the political, administrative and policy state of the RN. This centres on Admiral Sir John Fisher’s tenure as First Sea Lord with his revolutionary reform initiatives which polarised the service. It goes on to discuss the political and international intrigues of the day, the technical revolution in warship design, ‘The Churchill Period 1911-1914’, chillingly sub-titled ‘On the Eve of Armageddon’, the evolution of maritime strategy and the status of the British and German fleets on the eve of war. Rereading this work today, it is clear why it has so long been regarded as a masterpiece. The author's lively, clear writing remains a model of how academic history can be made accessible to a wide audience, and his character sketches of the leading naval and political figures of the era remain unsurpassed. Marder consistently made excellent use of the sources that were available to him, and his judgements still command respect. 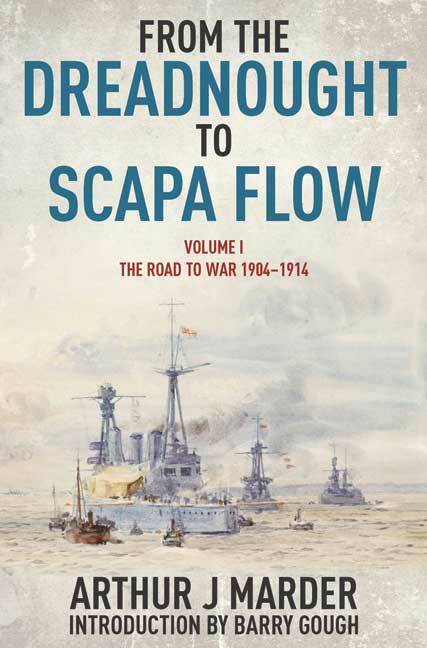 Half a century after publication, the first volumes of From Dreadnought to Scapa Flow remain an indispensable source on the Royal Navy's development in the decade before the First World War. It is impossible fully to precis so rich a work as this in a short review. Marder has marshalled, and presented with great economy, a vast mass of detail on every point so that we can see not only where we were in August 1914 but precisely how we got there. This volume and its successors are foundation works for anyone studying the Royal Navy before and during the First World War. The sheer quality of Marder's research and analysis enables him to capture the spirit of the age while at the same time providing a first class account of the development of the Royal Navy in the run up to the outbreak of the First World War. If this book isn't in your library, it should be! on Royal Navy history. His set of five volumes “From Dreadnought to Scapa Flow” made a major contribution to naval history. He offers some great insights into the Royal Navy of its time, the politicians, the technology, the and the changing threats. In Volume One, the author reviews in comprehensive detail the military, political and technical features of this period of Royal Navy history as it led into the first true global conflict and the combination of a number of new weapons systems, including aircraft and submarines. This is a valuable reference work that reads easily and will satisfy the most committed enthusiast of naval history. By reprinting this work in paperback, the publisher has done a great service to the understanding of a very important period of history.